Interior sliding doors are becoming a popular design trend that transforms spaces from dull and boring to warm and inviting - and the trend just got better! We have two great styles of interior sliding doors: The Laguna, which is similar to the popular "barn doors" you see in decorating magazines, and the Klein model, which can be used in a variety of spaces. Use either of these as a space divider or door between rooms that still lets in lots of natural light. It’s the "wall that isn’t a wall" and we’re ready to help you get the look! Made with thick tempered glass, Laguna doors glide on a rod with wheels to guide it. The minimalist design is a look that fits almost any décor, with a homey yet modern appeal. Use the Laguna to separate the kitchen from the dining room, or your bedroom from the master bath. Laguna doors allow for both light, privacy – and add value to your home. This is a hassle-free improvement to your home. 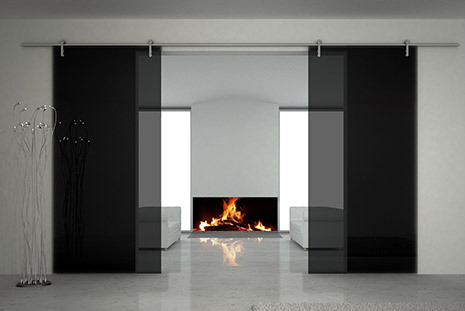 Dulles Glass provides the initial measurements, quote, and clean, efficient installation in the professional manner you’ve come to expect from Dulles Glass.